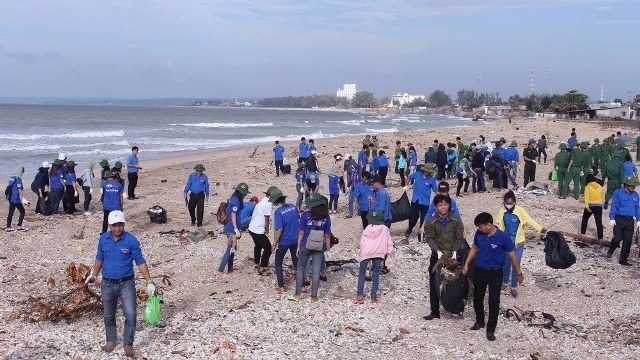 More than 300 young people in the central coastal province of Binh Thuan joined a campaign to clean up the sea on August 4. The “Let’s clean up the sea” campaign, held from July 12 to August 31, is one of the key events of the Summer Youth Volunteer Campaign 2018. It will go through 28 coastal cities and provinces nationwide to raise public awareness of the ocean’s significant role in human life. It is expected to draw the participation of at least 28,000 people nationwide. Nguyen Hoai Trung, Deputy Secretary of the provincial Ho Chi Minh Communist Youth Union, said that this year, Binh Thuan is selected to be one of the five key localities to host the campaign. The campaign includes a lot of activities, including garbage collection along beaches, and the establishment of volunteer teams to protect the maritime environment. The “Let’s clean up the sea” campaign was also organized in the central province of Binh Dinh on the same day, with crowds of youths and volunteers collecting rubbish at beaches in Quy Nhon city. The campaign, initiated by the Vietnam Television (VTV) 24 news centre and the Vietnam National Volunteer Center in 2016, has attracted the involvement of both local and international organizations as well as people from all walks of life.